Online classifieds firm Quikr said on Tuesday it has acquired on-demand beauty services platform Salosa for an undisclosed amount, as it seeks to expand its home services vertical. The acquisition is part of Quikr's plan to augment its home services vertical, for which it has committed to invest Rs 250 crore. The will help Salosa—which has been a partner of QuikrServices—strengthen its beauty services offerings. The investment also aligns with Quikr's strategy to scale faster and deeper into key categories under its QuikrServices vertical. Launched in November last year, QuikrServices helps users find local service providers—from cooks to carpenters—under various categories and also lists services such as interior designing, home cleaning and repairing, appliances repairing, catering, broadband installation, packers and movers and pest control. QuikrServices claims that it has 250,000 service providers offering over 80 types of services and is used by 1,00,000 customers every day. "The beauty services market is close to $5 billion in India and is growing which is evident from the increasing number of requests we get from Tier-I and Tier-II cities," said PD Sundar, head of QuikrServices. Launched in September 2015 by former Procter & Gamble executives Piyush Dhanuka and Anurag Nair, Salosa helps customers avail themselves of on-demand beauty and styling services by connecting them with verified and certified beauticians or stylists. Operational in Gurgaon and parts of Delhi, Salosa started off as a marketplace for freelance beauticians and stylists before shifting to a full-stack model where it takes care of the entire customer experience. "We share a similar vision with Quikr and look forward to combining our experience in the beauty domain to become the best beauty services brand in the country," said Anurag Nair, co-founder of Salosa. Founded in 2008 by Pranay Chulet and Jiby Thomas (who quit the firm later), Quikr was originally started as Kijiji India. The firm, which later rebranded to Quikr, is a classifieds platform that is used by over 30 million unique users a month. It is present in 1,000 cities in India and operates several classifieds businesses across C2C, cars, education, homes, jobs and services. Quikr's investors include Tiger Global Management, Kinnevik, Warburg Pincus, Matrix Partners India, Norwest Venture Partners, Nokia Growth Partners, Steadview Capital, Omidyar Network and Ebay Inc. 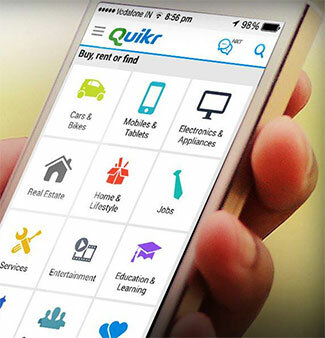 In March this year, the company launched Quikr Doorstep, through which Quikr will facilitate price negotiation, payment, pick-up and delivery for categories including mobile phones, electronics and appliances and household furniture. In January this year, Quikr acquired real estate portal CommonFloor to push ahead with its strategy to create separate verticals for key segments such as cars, electronics, jobs and education besides real estate.